The iHealth Blood Pressure Dock is the first of its kind, turning your iOS device into your very own blood pressure monitor. Simply plug your device into the dock, and using our free iHealth mobile app, measure and track your systolic/diastolic numbers, heart rate, pulse wave and measurement time. You can track your results across multiple devices. The dock even doubles as a charging station. How does iHealth Blood Pressure Dock work? The iHealth Blood Pressure Dock is a fully automatic arm cuff blood pressure monitor that uses the oscillometric principle to measure your systolic, diastolic blood pressure and pulse rate. The monitor works with the free iHealth MyVitals app that has personalized health tool to help you get the most out of your data and to better manage your health goal. 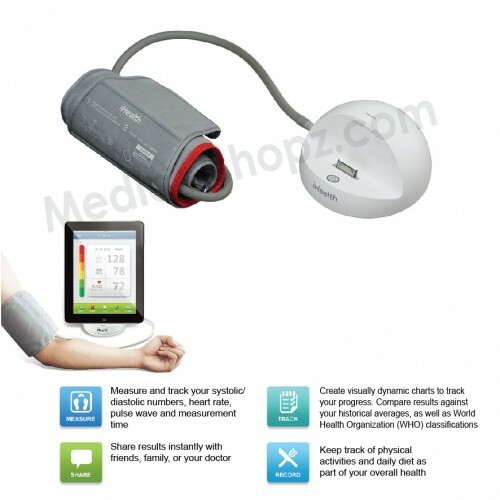 How accurate is the iHealth Blood Pressure Dock? The iHealth Blood Pressure dock has obtained CE medical certification (Europe) as well as FDA approval (USA). The dock also has obtained ESH Certification (European Society of Hypertension). Home monitoring is a great way to help detect and monitor high blood pressure. Regular readings taken over a period of time can track the history of your results and indicate any changes, fluctuations or elevations in your blood pressure. An individual high reading is not necessarily an indication of hypertension or other health issue. iHealth Blood Pressure Dock provides a convenient way to test, track and share your results. 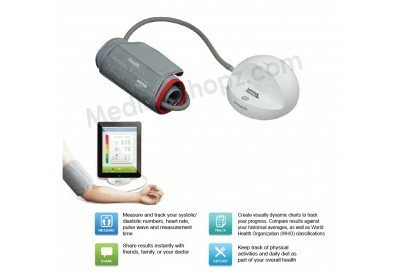 Who can use iHealth Blood Pressure Dock? iHealth Blood Pressure Dock is designed for adults. It should not be used on infants, young children, pregnant or pre-eclamptic patients. Can I use iHealth Blood Pressure Dock with more than one iPhone, iPad or iPod touch? Yes, you can use iHealth Blood Pressure Dock with as many different iPhones, iPads or iPod touches as you wish. Just install the iHealth MyVitals app on each device you intend to use with the dock.